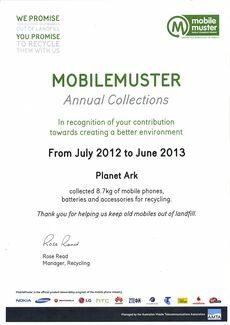 The Planet Ark office has received its certificate of annual collection for its workplace MobileMuster recycling bin. The certificate recognises workplace contributions towards creating a better environment and outlines the weight of mobile phones and accessories collected. From July 2012 to June 2013 the Planet Ark office collected 8.7 kg of mobile phones and accessories for recycling. MobileMuster is the mobile phone industry's official product stewardship program, and is a supporter of National Recycling Week. Retailers, schools and councils can also get involved in this free service and by doing so will help save precious resources. In addition, for every tonne of mobile phone materials recovered 10 tonnes of greenhouse gas emissions are avoided. For National Recycling Week, why not sign up to free recycling services for your workplace through MobileMuster and ‘Cartridges 4 Planet Ark'. Residents can search for recycling drop off locations at RecyclingNearYou.